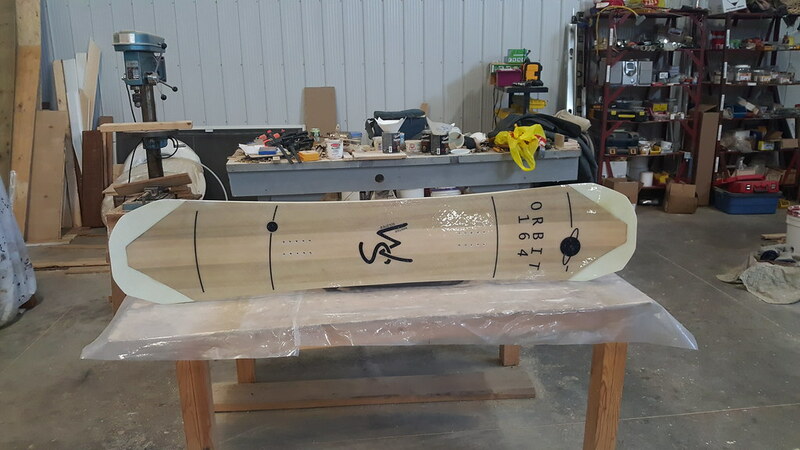 So my first board is completed and got its first test run last weekend. My expectations were fairly low due to a few issues with it. The base wasn't flat, even after a grind (in hindsight it could have take a lot more base grinding). There was a dry portion from the layup that had me worried about delam. Finally there was a small bubble on both the top sheet and base. The other thing I wasn't sure about is that it is quite stiff, quite long (164cm) and very wide (28cm waist) which is a fairly significant change from anything I had ridden previously. The conditions were OK but it is pretty much the end of the season out here in Ontario so the snow was slushy but still quite nice to ride in. Unfortunately I forgot to take a video. Despite all of my concerns the board felt FANTASTIC!! Now I am sure I am the least dependable reviewer for this as I am "slightly" biased but there are a few things that I noticed riding it that I just loved. This is the first truly wide board I have ridden and I love that extra width. I like carving hard and with the 28 cm waist I had no toe and heel drag at all and was carving harder than I ever have before! The extra length and stiffness was unbelievably nice too. I am quite a big guy and I don't think I have ever had a board that fit my weight and size properly before this board. It just felt like the board held my carves so much more firmly than anything else I had ridden. I had 0 concerns about washing out and think it can handle even more than I asked of it. The only negative thing is that the spots I am worried about getting some delam from, bug the hell out of me now. I didn't want to go crazy on these areas in case the board felt like an uncontrollable 2x4 but I love the way it rides and now I am going to do my best to fix those spots up to prevent the board dying prematurely on me. It shouldn't be too hard and I expect that the fix will solve these concerns pretty well. I bought some marine epoxy and will use that to fill in the dryer areas from the layup and solve the 2 bubbles. After this experience I will probably only try to ride boards I made from now on. It just felt so much better. Whether that was due to the design fitting me better or a massive bias, I'm not sure. Fortunately for me, it doesn't really matter as the goal is to have fun, and I had way more fun on my own board. The next step is to get a vacuum press and start doing this the correct way. Hopefully before next season I will be able to make another. Awesome! My most recent build is a wide board as well and I love it...it's a 151 park board with 265mm center width (still not nearly as wide as yours).